My loves, in front of our love tree (shaped light tutorial here). Two thousand thirteen was an amazing year for our family. While lots of great things happened, nothing can top the arrival of our sweet James. We all adore him and can’t imagine our lives without his smiling face. To thank you all for the love you’ve continued to show our family, we would like to once again give away $250 to Amazon.com to a random reader! This giveaway is open to every person on the planet who can type their name and email into a comment box. Sorry, animals without opposable thumbs. Enter by leaving a comment. You can leave one comment per day until the contest ends at 12pm PST on Wednesday, December 11th, 2013. Winner will be chosen by random.org. Prize will be delivered via emailed gift certificate to Amazon.com (if Amazon isn’t in the country of the winner, we’ll work something out.). If winner lives outside of the US, prize will equal $250 American. 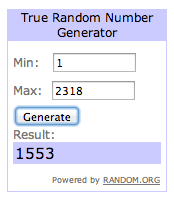 Comment 1553 is Aubrey! AUBREY! YAY! Congrats! Look for an email from me and respond within 48 hours, or I will pick another winner. Thank you so much to everyone who entered, and read. It was great to hear from so many of you who’ve been silently reading. We appreciate ALL of you!! Love seeing and reading about your family’s daily adventures. You have a beautiful family, inside and out. You’re so kind to do this giveaway! Thank you so much for this chance to win a gift card! Reading your blog has been part of my morning routine for years. One of the highlights of my day: reading about your awesome family! Hope 2014 treats you equally as well! Except no newborn… Just James in all of his glory. Adorable! I’ll have to remember to take a photo of my little guy using the shaped light tutorial this year – I totally forgot last year! Happy holidays Spohr family!! Reading your blog is something I look forward to every day!! Glad 2013 has been such a great year for the Spohrs! Hello!!! Hope this christmas is the best! “Sorry, animals without opposable thumbs.” BWAHAHA! I love reading about your incredible family! I love following James’ progress. My best friends baby is 3 months younger so I always know what’s coming next for him! Merry Christmas and fight on! Haha opposable thumbs I absolutely love your blog and watching your kids grow! Thanks for the tutorial on the lighting trick. I’ve followed your blog for many years now and enjoy watching Annie (and now James) grow. Love reading your site daily and seeing your cute kids! That pic with the heart shaped lights is great! Love it!! Merry Christmas! You’re right, it’s hard to top a new baby insofar as events go. Heather & Mike, I admire you for posting every weekday through both the good times and the bad. I look forward to seeing your posts in my Feedly app and always read them first. All the best for everything still to come. Beautiful photo, beautiful family! Thank you for always spreading so much joy! What an awesome photo – they look so huggable – Merry Christmas!!! Thank you! This is so generous. I’m glad that 2013 was such a happy year for you. Love the daily pics, they make me smile! Thank you for your generosity and your lovely blog. Merry Christmas to the Spohrs! Best wishes to your family! Your kids are adorable. I don’t have any children yet but my boyfriend and I hope to have some once we make things official. That said I would love the gift card to make his Christmas special this year. Happy holidays everyone! Happy Holidays to your family! Love the hearts! So very cute! I love the heart light! Happy holidays! Wishing you love and peace this season. So fun watching your family grow. I look forward to reading your posts everyday! They never fail to put a smile on my face! Thank you for sharing! What a beautiful photo! Merry Christmas and Happy New Year to the Spohr family! I’m awed by/jealous of your ability to get such a great holiday card picture! Beautiful picture. I really have to work on my bokeh (and getting my parents some grandbabies!). Joy and Happiness! What a beautiful family. Oh, and thanks for the lesson. I am going straight home after work to try it on my tree. I love the while you were at preschool series. I love watching Annie and James grow through your post. I can see features of Maddie in both of them. They are precious babes. Those two precious, smiling faces and a tutorial for the lights? Score! And I think it’s safe to say we ALL adore James’ sweet face as well as Princess Annabel’s. Love your blog and your beautiful family! What a great giveaway, Happy Holiday’s to you! Your site has been such a resource in raising my preemie twins. Thank you for sharing your precious family with us. Aww!! James looks so much like Maddie!!! Woohoo! Great blog plus an amazon opportunity? Twist my arm! Beautiful picture and beautiful children! Wish I had your photography talent. Merry Christmas! What a lovely giveaway— the Spohrs are my favorite only family, and I can’t wait to have my own kidlets. . . but in the meantime, Maddie, Annie, and James are my favorites. Happy holidays to you all! Merry Christmas! What a generous gift!!! Thank you for sharing your beautiful family with us all! Blessings to your beautiful family! Thanks for sharing your sweet kids and adventures and for the opportunity to win! Happy holidays to the Spohrs!! I can’t wait to see what “while you were at preschool” brings in 2014!!! Love the pic of your sweet babies! $250 at Amazon would get me a new TV for the basement, which would allow me to exercise down there and maybe get in shape (or so I tell myself). It has been such a rewarding time, reading over the year, about your family. You and Mike can make the most common of family moments bring smiles and laughter to us. Wishing your family a wonderful holiday season and a new year of adventure and hilarity. I would love a gift card with my birthday and christmas coming! Poor nursing student here. Love reading about your loves, they bring a smile to my face everyday. I look foward to reading your blog daily, thank you for sharing your stories . Happy holidays! Love reading the blog. Happy Holidays! Happy Holidays to your sweet family! What a beautiful picture! Merry Christmas to your lovely family. Merry Christmas to your amazing family! I love your blog and look forward to reading it every day! I love following your family’s adventures. thanks for sharing. Merry Christmas! That’s so nice of you guys! Adorable! So sweet! Thanks for the generoud giveaway! You guys seriously make the cutest little humans!! Thank you for all you do and have the happiest of Christmases! I love reading your blog! You are so real and relatable. Happy holidays to your lovely family. You guys are great….more and more each day. Love you guys, thanks for the giveaway! I don’t have children myself, but I can’t tell you how much joy I’ve gotten out of watching your children grow up on your blog. I look forward to your posts every day. Merry Christmas! Love you guys – Happy Holidays! Have a wonderful holiday! And what a great, generous giveaway. always love reading your blog, and admiring your pictures! Love reading about your family! LOVE the heart shaped lights! Annie and James are too cute. Such an amazing family, and a waaaaay generous offer!!! Much love from Ohioooooooo!!! What a sweet idea! Your children (all of them) are just beautiful! Love this photo. You all are amazing! I am so thankful for your blog. You inspire me and I love watching your beautiful children grow. I hope you have a wonderful and blessed holiday season this year! Merry Christmas to all of you and yours! Hope it is filled with lots of love, laughter, and everything good between! What a great use of opposable thumbs! I love your series on “What Happened while you were at Preschool”. I’ve followed your blog for years. I love being a lurker on your blog. Thanks for sharing parts of your life. James makes me smile and miss my children at that age. Thank you for sharing your precious cuties! This is such a nice giveaway! Thank you and happy holidays to your family, Heather! ADorable littles and coool heart bokeh! Look at those two gorgeous faces!! So sweet! And thank you, Spohr family, for being so generous again this year! You all are amazing! Beautiful children, and what a generous and thoughtful idea. I have followed your blog for a long time now, I’m so pleased to see a year filled with joy for you guys! I hope 2014 is even better! Aww. They’re adorable. You guys are awesome. Thanks for the tutorial link! You guys are the best! Merry Christmas! You guys are amazing! Merry Christmas! I love reading about Annie and James! Adorable kids and happy holidays. Thank you for sharing your lives with is. I know as a nurse, it has effected how I approach people and situations. I am a more compassionate person in general from your story. I think, like many others your children are adorable and you are a riot Heather! Your family makes me smile. Happy Holidays! Thank you for sharing your story. You guys rock! Merry Christmas to your family too!! Love reading your blog! Lovely picture, beautiful subjects! Merry Christmas to you all! This contest gives me the Holiday feeling! The feeling of hope, joy, and possibility! Seeing those sweet faces puts a smile on my face every time. Merry Christmas, Spohrs! This is so needed. We are struggling coming up with gifts this year! I’ve been following your blog since Mike had his own. I’ve laughed with you and I’ve cried so many tears and we don’t even know each other! I am so happy for your family to have had three little blessings in your life! Love keeping up with you and your family! Merry Christmas! You guys are too nice … It is always fun keeping up with your beautiful family! Happy everything to you, too!! So generous! I love following along with the Spohr family. I love reading your Lee Corso stories – I look forward to every College Gameday visit to see what you will come up with next. I love reading about your kids. My son is very close in age to Annie, so I enjoy readng what she’s up to. So beyond adorable! Merry Christmas! LOVE following your blog and reading about you and your adorable family. Happy Holidays! What a beautiful picture of the kids! Love this picture. Absolutely stunning! Merry Christmas, Spohr Family!!! Thank you! Wow, who knew enjoying your writing and family could possibly pay off? It really has been a beautiful year! Thanks for sharing it with us! May 2014 be even brighter for you and your family. Merry Christmas to all of you! Thank you for your generous spirit. Merry Christmas from the Pavan family to yours. Thanks for sharing your lovely family with all of us! Honestly, you guys are the best. Seriously, who does this? I hope you guys have a great christmas, and Santa is awesome to Annie and James. Yeah! I would love to win this. I am writing for my dog. Happy Holidays!! Wow, what amazing generousity from you and your family. It’s been a very good year! Wishing you and yours the best. Love all of you guys. Thanks for sharing your life with us all, your blog is the first thing I open at work every morning after getting here and logging onto my computer! Happy Holiddas to you all! I’ve been following your journey since before Maddie died and feel like I know you and consider you a friend even if you don’t know me from Adam. Keep up the great work. I love your photos of your adorable kids. Love your blog and family! Love that smiling baby! Makes me excited for my own baby boy due in march! Love your blog! Your children are adorable! I just wanna say that you guys awe such amazing people and so inspiring! Please enjoy your festive season! whether I win or not, I said a prayer that the most in need of it wins! God bless your family forever!! lots of love from my crazy bunch to yours. Love reading your blog every day! You can’t win if you don’t play so imma gonna play this game right here and hope for the best. Thank you for sharing the lives of your beautiful family with all of us. You are truly inspiring and it’s a lot of fun watching your beautiful children grow up. You have such a beautiful family! Merry Christmas! I love following your family on your blog! The kids are so funny and adorable. Merry Christmas! They are so adorable! Merry Christmas! I have been following your blog for a long time and was so excited to see that Mike got a job at BuzzFeed because my best friends husband is the VP of Product there so now I get to feel like I really know you through 6 degrees of separation! Love your blog and am a faithful reader! Merry Christmas to the Beautiful Spohr Family! Thank you so much for the give away! This would be oh so cool to win, but good luck to everyone!! Beautiful family! God bless you! He seems like pure joy. Thank you for sharing him with us daily. Merry Christmas to the wonderful Spohr clan! Hope to see you guys this Christmas!! James really does have the best smile and seems like the happiest baby ever! Love reading everyday, something I always look forward to in the morning. Merry Christmas! My dogs are very disappointed they cannot enter. Thank you, and happy holidays to your family! Yay! Fingers crossed!! I’ve got lots to buy for our little guy arriving in feb! I hope 2014 is just as wonderful for your family. But how could it not be with those two sweethearts?! Thank you for your thoughtfulness. Blessing!! May your 2014 be even more blessed. You guys make beautiful babies!! Merry Christmas! Happy Holidays!! I hope that 2014 is just as amazing for you and your family. I love reading your blog everyday, it is a part of my morning routine. Thank you so much for your generosity in this giveaway. Would love to win. Thank you for sponsoring this. You have the most beautiful kiddos! Darling family. I read daily and share your joys and sorrows. What a gorgeous picture! Happy Holidays to the Spohrs. Thank you so much for sharing your lives with all of us! We love seeing your beautiful family grow! I am so happy this year was wonderful for your family. I hope you have many, many more. Thank you for the opportunity. Merry Christmas! I love your family and have been reading your blog for years! Loved the tutorial, and the pic is precious! Although I am outraged on behalf of animals without opposable thumbs, I still your blog. I’ve been reading your blog since you were pregnant with Annnie. So happy to see your beautiful family celebrate a joyful Christmas season. Merry everything! Happy always! I really enjoy reading your blog every day! Thank you for sharing your lives and your children with all of us. Although we’ve never met, I feel like I know your family. You are very blessed! My boys are in their teens and I love remembering all the special moments of their childhood. Have a very Merry Christmas! I loved following your 2013, what a great year! Wishing you the best in 2014! Happy Holidays to your lovely family and thanks for sharing a little bit of your lives with us! So sweet! I do love those heart lights. You all are such an amazing family, and while I don’t comment often I read everything you write and have loved watching them grow along with mine. So generous of you! And happy that you guys have had a good year. You deserve it! You have such gorgeous children – all three of them. That James – he gets cuter by the day. I wish you all the best! Very generous of you, but you don’t have to buy my love. You have that already! Happy and thankful greetings to you all! Merry Christmas! Thanks for the awesome giveaway! Love following along with your family all year! Merry Christmas! Your children are so so beautiful! Your generosity shines through so much with a post like this. Have a wonderful Christmas, Spohr family! Racoons finally have the advantage. FINALLY. My little guy is just a month and a half younger than your handsome little Jamesie. It’s been such fun to see what he’s up to, and anticipate my guy doing the same things soon. Your “while you were at preschool” series pretty much makes my day. Much love to you and your family. Thanks for sharing with all of us, it is lovely to read about your adventures. You are an amazing family, and I enjoy following along with your story. Merry Christmas! I love your little family. Merry Christmas to you and yours. You are so sweet and generous! Love those smiles! Yay – thanks! Just for fun, I typed this without using my thumbs!! What an exciting giveaway! My boys love the Annie videos and want to know when James can get in on all the fun! Going through a divorce right now, this would totally help bring some much needed holiday cheer. You guys are awesome. Can’t wait to meet James. James is the most photogenic baby ever! He always seems so much bigger than he is. Too cute. I’ve been following your blog for years – you don’t know me, and I rarely comment, but your kids always leave a smile on my face. Have a wonderful Christmas, and I hope 2014 holds nothing but good things for all of you. Love your blog! Happy Holidays! Thank you! I look forward to reading your blog every day. Precious!! And I’m so done having kids, but James? He brings back the old baby fever, full force. Blessings to the Spohr family! 2 healthy, happy kids-best Christmas present ever! How incredibly generous! Merry Christmas to the Spohr family!! I love reading your blogs. Mike’s too! James is the perfect beautiful mixture of Madeline and Annie! Seasons Greetings!!! Merry Christmas and Happy 2014!! It has been such a joy to follow along on your adventures over this wonderful year! Merry Christmas and all the best to you and your family in 2014! Thank you for sharing your life – the ups and downs. Adorable as always. I look forward to reading your blog every morning. Merry Christmas! You have a beautiful family. We too have a daughter in Heaven and your strength has helped me through hard times. We are also expecting a little boy in February for our little Rainbow baby blessing. reason # 1: you dress up your kids in awesome costumes. Thank YOU for sharing your blog with us! I check almost everyday and I’m so happy for you and your awesome family! Would so love this. Thanks, Those smiles are beautiful. Thank you for writing everyday! I start my day with your blog! I love your blog, the “when you were in preschool” pics…you name it. You have an awesome family! Merry Merry and Happy Happy! Thanks for the opportunity to win something that would help so much this holiday! Happy Holidays!! Love the picture and love reading about your cute family :). Happiest of holidays to the Spohrs! Happy Holidays! What a great picture! I thought Maddie and Annie were the cutest babies ever…but that James is really stealing some hearts!!! Love the blog posts! Happy Holidays! What a lovely gesture. You bright so much joy to us all. Happy Holidays to your family. Adorable picture! They are too cute for words! Happy Holidays! Thwy are so cute, James looks a lot like Maddie. You make the most adorable children! Your children are really adorable. Happy Holidays from a long-time reader. I love your babies …. and you and Mike. Thanks for the chance to win, I could sure use it! What a great picture! Merry Christmas! Oooh…excited for this! Come on Random.org! Pick me! Pick me! What precious children!! Merry Christmas to you all! Yay for a happy 2013. Love the smiling kiddos – And that awesome bokeh! Love your blog as well as everything else about your family. God Bless! How generous of you guys! Reading your blog has been part of my morning routinue for the last 4 years. What an adorable picture. I think James really looks like Maddie in that one. Love your blog! Merry Christmas!! Very sweet picture and thanks for the light tutorial! I love seeing pictures of your beautiful babes! Thank you for always being so honest! Hope 2014 is an amazing year as well!!! I love watching your adorable kids grow. You take the best pictures ever! Merry Christmas! Love that you do this every year…Happy Holidays, Spohrs! I’m so happy that this year has been a good one for you! You guys deserve it! Your babies are just precious! Merry Christmas to your family! You are so generous! I’ve been following your blog for a couple of years now. You guys are amazing! Merry Christmas!! Happy Everything indeed! Love your sweet family! Christmas is extra magical with new babes! Hope you have a wonderful Christmas! Merry Christmas! Thanks for sharing your family! Love your blog! Merry Christmas Spohr Family! What beautiful babies! That tutorial is way cool. Well sure! That sounds lovely. James is so darn cute. Can I borrow him? I have so loved watching your family grow. You are amazing, and I hope you all have a wonderful holiday season! Mama needs a new something…I will think of something good when I win. =0) Thanks!!! I love watching your family grow – I wish only the best and pure happiness for your future! Merry Christmas! We are grateful you share your family with us! Your children are Beautiful! I love ready your blog!!! Your kids are so cute… You are a strong family with a great sense of humor! Wow that is so very sweet of you. Your kids look too cute. Heather, I can’t get enough of your funny twerking signs and amazing love for your kids. Happy Holidays to you, Michael and the kids! Have loved reading your blog for several years, but this year was even more special just because I was pregnant at the same time. Happy 2013! So kind of you! Thanks for the opportunity and merry Christmas! I love reading about your beautiful family! Merry Christmas! I love what this year has brought for your family! Merry Christmas! Such a sweet picture of them! Would love to win. Merry Christmas! You have such a beautiful family and I look forward to reading about them. Those kids are so darn cute!! Merry Christmas to you and your beautiful family. Here is wishing you blessings for 2014! Merry Christmas Spohrs! And Merry FIRST Christmas Jamesie! Happy Holidays! Thanks for this chance. What a wonderful thing to do! Merry Christmas!! I love your blog. I read several blogs each day and I always save yours for the last. It’s my favorite. I laugh and cry at your posts and your children are so blessed to have you and Mike as there parents. Happy Holidays! Happy Holidays! Thanks for making me smile. Your blog is one of the first I read every morning and it kicks the day off right! Merry Christmas & God bless to the Spohrs! All our love this holiday season! Thanks for including us in your lives! You guys are the best. Happy holidays!! Happy holidays right back at you! I am a new reader… This would be an amazing help this time of year!! That picture is just pure love. Merry Christmas! I’ve never been so thankful for my opposable thumbs! Merry Christmas! You guys are so fun. Have a wonderful Christmas with all your Loves! yay! so festive of you! thank you! Thank you for everything you share on your blog! Each day I look forward to your posts. The pictures of your kids are always so adorable and I’m loving the James on the shelf series! Thank you for giving me something to look forward to everyday when I get on my computer. I would be estatic to win a $250 Amazon credit. We are running really thin right now and I even had to take back a few of my kids Christmas presents over the weekend to buy gas (Just the extra ones not the one they asked Santa for thankfully). I hope your family has a great holiday! Merry Christmas! Have enjoyed James’ escapades while Annie is at pre-school! So cute! Thanks for bringing smiles to my day! Such a lovely photo! Their smiles make my day. I’ve enjoyed the “While you were at preschool…” series so much. Thank you for sharing that and this great giveaway! Adorable pic of your loves.. Thank you for sharing your lives. I read everyday and love seeing the happiness in your family after all that you go through.. I was so excited yesterday when one of Mike Spohr’s articles popped up in my news feed!! I’ve always loved reading your blog…so nice to see my friends do too!!! 2013 has been really hard for me–I lost my mom. So I cannot wait to turn the calendar to a new year. But I have enjoyed watching your sweet family grown, and those curious blue eyes on James. I enjoy your story. Your is one of the few I still follow. Thanks for sharing with us. Great pic! They are growing so fast! You have such a beautiful family and I look forward to reading your blog every day! Merry Christmas!! I can’t get over how gorgeous all of your kids are. Merry, merry! Your family brightens my day every time I read your posts. My favorite addition to 2013 has been “while you were at preschool” and now James’ elf pics on instagram. Too cute! Happy holidays to all of you. Oh they are the cutest! I have been a long-time reader and always love reading your stories! Merry Christmas! That is a fantastic picture! Would be perfect for your Christmas cards! I read your guys’ blog just about every day. I have a 5 year old daughter and an 11 week old son, so I can relate to a lot of your stories. Happy Holidays, Spohrs. Thanks for giving me something fun to read every day! You guys are the best. I wish for more fantastic things for your terrific family in 2014 and beyond! Thank you for having such a great blog – and as a retired senior on a wee pension, the Amazon gift certificate would be a luxury! I have so enjoyed watching your babies this year! Thanks! I love seeing your daily adventures! Wonderful Blog! I follow you every day! Those are two very adorable faces! You have absolutely beautiful little ones. Now I’m off to read your tutorial on how you captured such an amazing shot! Thank you for sharing your lives with us. I look forward to your posts daily. Have a Merry Christmas with your beautiful family! What a cute photo! Merry Christmas to your family! Merry Christmas to the Spohrs! Thank you for the giveaway! Have a wonderful holiday season! What a beautiful family…Happy Holidays! Happy Holidays! love you guys!! Thank you for sharing your lives with us. May you have a blessed holiday season. What a generous and thoughtful gift to your readers! But really the “While You Were at Pre-School” series is gift enough! OMG what a giveaway! Love your family! Love watching your kids grow and seeing the antics that all of you come up with! You guys deserve all the happiness. Merry Christmas to your beautiful family. Seriously?!?! You guys are too much. So kind and generous! Merry Christmas!! Love reading your site!!! December 11 is my daughters birthday. That has to be good luck right??? HAPPY HAPPY Holidays. Their smiles are infectious! You have a dear friend that is also a writer in my home town who owns a cat with thumbs…So is Wink allowed to enter? Happy Everything to the Spohrs! Entering so I can give this to two teenagers I know in great need. Happy holidays to you and your beautiful family! This picture is wonderful! Love keeping up with you and your adorable family. Happy Holidays! Happy Holidays to your family from ours! I love your blog and read it everyday! Thanks for sharing your family with all of us! What a lovely gesture! Happy Holidays! Aww Annie and Jamesie are so adorable. Love the picture! Happy Hidays! Your kids are adorable!! Love the hearts on the tree!! Thank you for your generosity. Love watching your family grow. Thanks for sharing. Merry Christmas! Love that picture! Such sweet faces. I love reading your blog everyday and learning what your family is up to! I would be very grateful for the gift card! 2013 has brought me insomnia. Total bummer, BUT I like knowing I can read your posts when I’m up in the middle of the night since they post so early in the am. Amazing. Hope 2014 is just as incredible for you guys. Merry Christmas! They are so so adorable! Happy holidays Spohr family! What a great picture! Happy holidays! Thank you for the “While you were at Preschool” series. I love those photos! This would be such a blessing, especially since I found out 2 nights ago I’m pregnant with our 4th child!!!! Thanks for the best blog ever!!! I have enjoyed your posts since 2009! James looks so much like Maddie in this photo. Beautiful children. Merry Christmas! Heather, I forgot to ask, do I post a comment on this post only, or any post, once per day? Happy Holidays Spohrs. Thank you for sharing your lives with us. Those kids are adorable! Never tire of the pictures of them. Great give away too! Your kids are TOO cute. First comment, long, long time reader from Ireland, love following your blog! Well that didnt happen – but you are still my favorite bloggers out there! Yay for cute Chirstmas kids!! Merry Christmas! Dang those are some cute kids! I would love to win the gift card and thank you for sharing all your wonderful writing. Merry Christmas to you all! One of my favorite blogs! Happy Holidays to your sweet and blessed family. I hold you in my prayers and read your blog daily. This is an amazing thing to do for your readers! Merry Christmas to your beautiful family. I love reading your posts every day, and wish you all the best in 2014! Aw, I love how tightly she’s squeezing him, and how he holds onto her arm. What cuties. I love the picture, the hearts are so subtle but perfect. Were the kids facing a window or anything? I’d like the recreate a picture like that with my kids and am trying to figure out the light. I would love to win this, but even if I do not, I hope your family has an incredible holiday, I enjoy your blog very much. Thanks for sharing! What a great family photo! I’ll have to try that with my kids! What an adorable picture and generous giveaway! I Love your blog so much! Also, love your generosity! All of your kids are so beautiful! I too would like to know, if wanting to re-enter the drawing ea day do we comment on this thread or any future posts? Happy Holidays! My kids and I are constantly entertained by your creativity. Thank you for sharing! Love your blog, your kids keep me smiling! Can’t wait for the christmas posts! great picture! Wishing you and yours a Merry Christmas! Wow James looks like Maddie! What a beautiful family you have. Merry Christmas to you all! I can’t wait until we are blessed with another child so that I can (hopefully) see the same wonderful bond between them as your children have! I read your blog for seversl years now. I also have a girl who was born in January 2011. This year we welcomed our baby boys on the same day – May 30. So your James and my baby boy are on the same page! It is fun to read about your adventures with Kids. Happy Holidays! I just love your family. I look forward to your blog daily. James is simply wonderful and Annie is delicious! Happy Holidays to the Spohrs!!! James has a wonderful smile indeed. Heather, you are so generous! Every day I look forward to seeing pictures of smiley little Jamesie. He is just the cutest baby! Love the blog…love the pictures!! This picture was gift enough!!!! Your kids are always so cute!!! Have a wonderful holiday season! Love amazon and The Spohrs..
Yay, thanks Spohrs! Happy everything to you too. Hooray for a good year! I love your family even though I’ve never met you all in person. Thanks for sharing your very special lives with the world! Happy Holidays! Such a sweet shot. Thank you for all that you share with us. Yay for amazon and amazing families. I must have missed that tutorial the first time around. I am having fun with your tutorials. Keep them coming! Love seeing those cute faces! Merry Christmas! Thank you for the chance to win. You are an amazing family! With beautiful and obviously happy children! Merry Christmas! While I wouldn’t say no to a gift card I mostly want to thank you, I love your blog, it is always a treasure to read. Wishing you an even better 2014! long time lurker! love your family, love the blog happy happy holidays! Happy that 2013 was such a beautiful year for your family! Thanks for the chance to win and support my Amazon addiction :). Happy Everything to YOU! Thank you for sharing so much. Such a sweet picture! Blessings to you and your family, Heather. Beautiful children!!! Wishing your family a wonderful holiday season! I have very much enjoyed becoming a virtual friend. Happy holidays to you and your wonderful family! Very generous of you guys to do this again! And the kids are looking cuter than ever. Your family is the cutest! What a sweet pictures, I just love James facial expressions! Cutest pictures EVER! James has such beautiful eyes! From the moment I heard sweet little Maddie passed on another blog I became an avid reader of your blog. Rejoicing at your triumphs sometimes commenting:-) Becoming more informed and aware of the struggles premature babies go through. I personally think Mike and you are amazing parents James and Annie are very lucky. You guys are SO awesome!!! I am so happy for you and your family…you deserve all the good that comes your way. What a sweet gesture. Thank you, Spohrs! Look! It’s yours and Mike’s mini-me’s! Cuties. Thank you for sharing those sweet faces with us. Merry Christmas! I love reading about your family! Merry Christmas! Happy holidays to you and your sweet family! Aww, what a lovely picture! Merry Christmas and happy new year! You are so generous! Love following your adorable family. Would love this thanks for sharing! I love that you do this giveaway every year! Thanks for sharing your writing and photos here. Merry Christmas! You have the cutest little family. Hope you guys have a wonderful Christmas! Love the pic and glad you had a great year! Beautiful picture of the kidlets! Merry Christmas, Heather. Happy everything to you too! Love seeing Annie and James! Your kids are adorable! I love reading your blog! You and your family are inspiring!! Beautiful picture of beautiful kids. Merry Christmas 2013. Your family is beautiful. Love reading updates from your family daily. Wishing you happy holidays and happy and healthy new year. Great gift! It just so happens that I have about $250 worth of merchandise in my Amazon cart. I’m so happy for you guys that James arrived this year! I just love your family and your blog. Wishing you a magical holiday season. I read daily and never comment. But for a chance at $250. I can break that tradition! Thoroughly enjoy reading your blog! Hope you guys have a Merry Christmas! Would love to win! So many presents to by for my best friends new little boy who’s 2 months younger than James! I love your blog. I comment from time to time. I read every day. I’m in … but more importantly I need to say your kids are so dang cute!! and — I love how you choose to keep Maddie a part of their lives. Merry Christmas to all of you — you needed a good year! Very nice of you to do this for the readers! Can’t wait to read about the kids reactions to Santa coming to visit! Have a great holiday season! this is too sweet! I hope that you and your wonderful family have an even better 2014. Thank you for sharing your family with us! Thank you for sharing your family with us all! So thankful for the safe arrival of James into your family this year! Love your blog, and all of your pictures! I have an almost 3 year old girl & a 4 month old boy. It’s fun. Very nice of you to do the giveaway! You guys are kind and your children are adorable. Hooray! Happy holidays! 2013 was an amazing year for my family too as we welcomed our baby boy Grayson in April! He is the light of our lives, a miracle after eight years of waiting, and we can’t remember what life was like before he was here. Much love and happiness for the holiday season and the new year! Merry Christmas to your whole beautiful family. That picture is so darn cute. Annie looks so grown up! PS: I want/need more of your cooking/baking posts! I was going through the ones I have bookmarked last night, they all look soo good. What a beautiful picture-Merry Christmas! Love the pic–they sure are cute! Merry Christmas, Spohrs! I hope you all have a wonderful holiday! Happy Holidays Spohrs!! Thank you for sharing your life with us all over the past years. I hope Annabel and James have a magical Christmas! Love the picture and giveaway!! I have loved your blog since I first started reading it. You children are beautiful!! Wow! How generous! Tis the season of giving. What a fantastic giveaway. You guys are awesome! I have been reading your blog for years and seriously adore your beautiful family and stories about them. Thanks for being so generous with this contest but more importantly sharing your heart. Love Amazon! Thanks for the opportunity to win this! With a new bright-eyed baby boy myself (born in October), an Amazon gift card would be a dream! Also, have been reading the adventures of your family for years now, and I feel like you’re all friends And lastly, congrats Mike on landing a gig with my second favorite website! Happy holidays to the 5 of you from the 4 of us. Love your blog, always my first read every morning. Thank you for doing this giveaway. Love your pictures with the hearts! Great tutorial! Great giveaway! Keeping my fingers crossed! Happy Holidays! Merry christmAs sporhs!!! Love reading about your family. Your loves are just adorable! Merry Christmas to you and your family! I’m grateful to have the opportunity to enter this giveaway. I intend on purchasing some fabulous gifts for my family and a couple for the children who aren’t as lucky to have gifts at Christmas. Your children are adorable and so blessed to call you mama, Heather. Merry Christmas! What an amazing gift! Happy Holidays! What a fun, sweet Christmas you have in store this year! Love this beautiful family! What a wonderful giveaway. Merry Christmas and Happy New Year to the Spohrs! Love this blog! Check it every single day! So happy that you and your family are receiving some happy blessings and your babies are absolutely perfect! Thanks for being a wonderful inspiration! So generous! Happy holidays or the Spohrs! Merry Christmas to you all, too! Teachers can always use a gift card!!!! Happy holidays to your family. Merry Christmas to an adorable family! Thank you Heather and Mike for sharing your lives and the lives of Madeline, Annabel, and James! Wishing you happy holidays from our Wisconsin home all the way to California! Thank you for your family stories/photos that brighten my days. I wish you guys all the happiness out there! Love you and Happy/Merry/Awesome every holiday! Awesome! I would use it to send some school supplies to my friend who is a teacher. You guys are so amazingly generous! Thanks for all you do. Thank you for sharing your three beautiful children with us over the years! Merry Christmas from Canada. Love the pic and all the pics. What a lovely gesture to give away an amazon voucher. Happy Holidays! Love your blog! Happy Holidays to your adorable family! Hoping 2014 brings you nothing but good things! Love your blog, Merry Christmas! Oh.my.goodness! They are SO cute! Commenting! Jamie is getting so big! I start every morning by reading your blog. Thank you for sharing your beautiful family with the world! Thanks for sharing your beautiful family! Love your blog and reading about your sweet kiddos. merry christmas!!! how great to make someone’s christmas bright!! Here’s to a happy healthy 2014 Spohrclan! Happiest of Holidays to the Spohrs!! Thank you for sharing your lives with us!! I started reading your blog when you lost maddie. I had just struggled with recurrent loss and had finally had my firstborn. As I read your words, tears streamed down my face. I don’t know if I was crying for you or for me or for both of us and our loss of innocence. Merry everything to you also! You have a beautiful family! Merry Christmas and all the best for 2014. How thoughtful! I love reading your blog. :o) Thank you for a great giveaway. That would almost pay for my books for next semester! Annie and James are too adorable. Merry Holidays and all that jazz! Love your family and getting my daily fix of your adorable kids! You’re far too thoughtful. Happy holidays! Wow! You guys are generous! Thanks for Sharing your family with the world. How sweet of you guys! Merry Christmas!! Always enjoy seeing your sweet childrens faces and of course love reading your posts! Season’s Greetings! Yay I have thumbs! Thank you allowing us to journey with you. Your James the elf instagram photos have helped me through a really tough week. Thank you and Merry Christmas. I love reading your blog – you guys are adorable! The While You Were at Preschool series is simply genius. Happy holidays! Merry Christmas and as some have said, thank you for sharing your sweet family. Beautiful picture ! Happy Holidays ! I have opposable thumbs! Love reading your blog.. Your kids are adorable! What a beautiful picture! Merry Christmas! I read your blog daily. Love your stories about USC, my husband graduated in 1977. Maybe we’ll see you at a game sometime. Love reading your blog! Happy Holidays!! Such sweet babies! Hope you had a wonderful holiday season! Thank you for such a wonderful chance! Yay! but my cats say boo to the no opposable thumbs discrimination! Those are a couple of sweet faces. Thanks to the Spohr family. I love reading your blog and hope you guys have an amazing Christmas! Thank you for all your inspiration! Great picture of those cute kids! What an amazing giveaway! Your kiddos look adorable as always! aww, the Spohr’s are a truly amazing family. You have the cutest kids! I love seeing photos of them together. Thank you for sharing your family!! Merry Christmas!! I thoroughly enjoy your blog. It’s one of only two that I even take the time to read any more. I can’t get through the day without my Spohrs. Happy Holidays! I enjoy your funny, witty, heartfelt posts. Thank you for sharing your family with us! Love those sweet little faces! P.S. I would love to win!! Thanks for sharing your family with us. James’s smile is infectious. James definitely has Maddie’s eyes!! Can’t believe it took me this long to figure that out! Love reading about your adventures with your beautiful family! I look forward to reading your blog everyday – as I have the last 5ish years!! I can’t believe how much James looks like Maddie!!! Aw, you guys are the greatest! Merry Christmas! It’s been a joy to see your family grow and heal. Such a sweet, sweet picture of them! What beautiful babies! love your blog, have been reading for years! Beautiful photo! Merry Christmas Spohrs!! I have enjoyed following your family in 2013! Wishing you and your family a wonderful December and 2014! I love the pictures of your kids and amazon! Thank you so much for your generosity. You have beautiful children who always seem to be happy. It shows how much they are truly loved by you both along with the rest of your family. Loooove the picture! Happy holidays!! Such a gorgeous picture! Best wishes to you and your family during this glorious holiday season! Happy Holidays! Love the photo. *Spohrs! So excited I can’t even spell! Happy Holidays! Love reading your blog, you are an amazing woman. Thank you for sharing your lives with us! I hope you guys have a wonderful holiday!! I’ve been reading your blog since before James was born but this is my first comment. Love reading about your family! Your family is beautiful! Happy Holidays!! Read all your post and love them all! Happy holidays! I’ve read your blog for awhile (since before Annie was born) and have loved watching your family grow and the love y’all share. Merry Christmas, Spohrs! Merry Christmas! Love the pic. Your children are gorgeous! Happy holidays! I love the shaped light tutorial!! So jealous your tree is already up!! I love your family. The kids are just adorable. They are both so precious! I love your blog and your family! Happy Holidays to you!!!! I love your blog and I’d love to win! I absolutely love reading your blog! Gorgeous picture! You and Mike are so generous. Thank you for sharing your wonderful family with the rest of us and happy holidays to you! What a generous gift! Merry Christmas to your sweet family! I love your blog. And my 4 and 20 month old daughters love to watch “Annie videos”!! Merry Christmas from Mississippi!!! You’re so generous! Merry Christmas!! Wishing you the happiest of holidays with your beautiful family! ..and what a sweet addition James IS to your lovely family! Wishing you all the best in the coming year! Please upload more videos of Annie and James laughing together. That video made my day–your children are charmers! Just love to see and read about your beautiful family. Thanks for sharing with us! Wow, that’s really sweet! I’m an Amazon junkie! I hope the Spohrs have a wonderful Christmas and enjoy your many blessings throughout the new year! Thank you for letting us be part of your family, this year and all the years before. Happy holidays! Oh yes I would love this! What a great idea! How beautiful. Your heart must ache each day at their loveliness! Merry Christmas to the Spohrs! Hope your holidays are peaceful, merry and full of love. Annie is so big now! How time flies. I was following your blog since Maddie in Google reader but now that they have terminated the service, I had difficulty in catching up to the daily happenings at the Sphor household. They are both adorable! You are so blessed in having two beautiful children Heather. ? What a beautiful photo! Merry Christmas Spohr family! We also welcomed a little guy into our family this year and I love reading your interactions between Annie and James as we have boy and a girl, too. Here’s to 2014 being even better! I am a friend of the Oswolds and started reading your blog years ago. Best wishes for a wonderful holiday season! I hope that you will eventually gather all of the “While You Were At Preschool” photos into a book. They are so creative and hilarious! The collection would certainly make a great fund raiser for your favorite cause. Amazing how much James looks like Maddie. Adorable! Your family is beautiful! I love reading about all the adventures. wow, you guys are amazing, as usual. What a beautiful picture! James smile just melt my heart! Love the lights!! I keep meaning to try it!! Been following along on your family’s journey since 2009 and I am always blown away by both the love and generosity your family continues to show year after year. Happy Holidays and Merry Christmas Spohrs!! Love you guys!! Up only one day and you already have over 900 entries. Wow! I’m excited to be one of your readers having a chance to win this. My entire family is addicted to Amazon, and that includes my three children (ages 19, 17, and 11). I’m so happy for you, and I’m whishing you a wonderful Christmas and a 2014 full of joy. The picture is really adorable! Hugs!!!! Ooh, ooh pick me , pick me!!! Merry Christmas to your family from ours! You guys are too cool. Thanks for all the laughs over the years! Thank you, Merry Christmas, and much love to the Spohr family!! Very sweet of you to think of us! Merry Christmas Sphors! Thanks for your blog, both of you are very good writers. And thanks for the giveaway! My goodness, that is a gorgeous pic. Thanks for the giveaway! Merry Christmas! Oh what fun I would have at Amazon with that much $$$! 2013 was very much not my year, but your continued strength, sheer joy in your family…makes your blog my go-to, and has helped me put my own losses in perspective. So i too say a huge thank you! That picture is perfection. Merry Everything! Great prize, thanks so much for it and for sharing your lovely family with us. Love reading about your family. merry christmas to your sweet family!!! Such a lovely photo! And YAY for fun giveaways!! Happy holidays, Spohrs! Love all the updates and for sharing your family with us all! Merry Christmas Spohr family! Wishing you all continued happiness the rest of this year and in 2014. Love your blog totally! I read it every day. So much cuteness in this picture! Beautiful pic, beautiful kids! Merry Christmas, Spohrs. What a lovely idea! Merry Christmas! Look at those two sweeties! Such a cute picture. Happy Holidays to you all! Great photo, as always! woot woot, sign me up for some cash! Merry Christmas Spohrs! Here’s hoping 2014 is an equally great year! Reading your blog has become a daily ritual for me – love your writing and your beautiful family!!! It’s hard to believe that I have been reading your blog for years. Longtime reader wishing you Happy Holidays. Happy First Christmas, James! Happy First Christmas as a big sister, Annie! James looks like a toddler already in that picture! Merry Christmas to your sweet family! I love amazon! Subscribe and save and prime shipping! Love the love tree, and your littles are adorable. Cute picture with cute kids! Woo! A gift card would come in handy this season! 2013 was such a fun and exciting year for your family! I truly enjoy your blog, the Spohrs have a fan all the way across the country in New Hampshire. Merry Christmas! James is such a beautiful baby! Pick me! Me me me!! I read your blog every morning. Your family is amazing. ???? Ignore the question marks! That was supposed to be a happy face!!! Happy Birthday, Rigby! And happy Christmahannukwanzakah (as my sister would say) to all if you!! I love that I can come here every day and read what you’ve been up to. Thanks for writing. Merry Christmas! Your generosity is inspiring! I forgot to tell you what I’d use the gift card to buy: one thought is an airdyne bike. I’ll tell you the rest of my ideas over subsequent days. So generous!!! Here’s hoping I win!! Love your blog! It’s on my first to read list each morning. happy Holidays! Merry Christmas! I love reading about your sweet family. Thank you for the giveaway! Happy Birthday to Rigby. We love our furry friends too! i love your “babies” and reading about all your days. I just love seeing the pics of your precious children! I love the Spohrs – thank you! I read Mike’s article on Buzzfeed about how you know you are almost 40- it was so true! Love reading your blog! I love reading about your family almost as much as I love amazon gift cards! Happy Everything to you and your family as well! Merry Christmas! Beautiful, happy children! Nothing better! This is an amazing gift. Reading your blog is my favorite part of my morning routine. Thank you! this is such an awesome thing to do! I check out your blog almost every morning before work. Those smiles help make my day! Merry Christmas to all of you! Love the lights. I will have to try that for my Christmas card! You’re so creative, thanks for sharing! Sending thanks and wishes for a wonderful 2014! Love this picture, and your blog! Merry Christmas!! Such a sweet photo! James is so happy all of the time, always a grin on that face! Such a generous thing to do! My cat is super bummed that he can’t enter! Happy Christmas! Day two and it’s Rigby’s birthday, to boot! So excited to see who wins! I love your “while you were at preschool” posts (as well as all your other posts). They make me laugh so hard — which is great. I hope that the Spohrs have a wonderful holiday season and that 2014 brings you much happiness and joy. I’ve enjoyed getting to know your beautiful family through your writing these last few years. Merry Christmas to all of you! I’m so jealous of your shaped lights! I L.O.V.E. the cute sweaters on your adorable babies! Thanks for entertaining me this year. Love your blog, and love reading about your family every morning! Thanks for sharing with us. I’m just happy your family had such an awesome year! Happy everything to all of you!! This is the first place I come when I sign in my computer at work every day! Can’t wait to see these beautiful little faces! What a lovely photo! Such a beautiful family. Thank you for sharing your lives with us. I am very upset at your clear bias towards humans. Really. This is the 21st century, Heather! Happy Holidays! Reading your blog has been my morning coffee ritual every day for the last 4 years. So glad this year was a good one for you. Love following your family. Merry Christmas. Merry Christmas! Thank you for you generousity!!!! What a lovely idea! Thank you and Merry Christmas! Love your blog so much! What a great giveaway in time for the Holidays! I’d love to win this but if I don’t, I still LOVE visiting your site and filling myself up with those beautiful, deliciously wonderful children of yours….and your written words too! Merry Christmas Spohr Family and Happy 9th Rigby! I think I have posted this before but I STILL laugh over Rigby’s Great Peanut Butter Jar Caper! Happy holidays! Love your love tree and your lovely family. Love that picture of James and Rigby, so precious! I have been following you for a long time and enjoy the updates and pictures so much. I am an older follower I am sure but get so much joy out of watching your family grow. Maddie will forever be on my prayer list! You have gorgeous babies and a gorgeous spirit. Hope your holidays are amazing! Love reading your blog every morning! You and Mike make beautiful babies. Adorable! I want to know how you get a preschooler and a baby to pose so nicely for a picture! Adorable! Love following your life with your beautiful babies! my cat does not have opposable thumbs but can type his name…. A beautiful picture of your blessings. Merry Christmas! You’re nice to do this giveaway. I hope I win! would be nice for Christmas and not being able to keep my job while I student teach next semester. Happy Happy holidays! 2013 was a doozy of a year. I can only imagine what 2014 has in store for us all! Merry Christmas to you all! I am so happy God blessed your family with another member. He is precious and handsome beyond words. I love your blog. Merry christmas! Your kids are so cute. It is so fun to read your blog everyday and keep up with your family’s adventures. Happy holidays! Thanks for entertaining me every morning. PS…saw Mike’s buzzfeed article “things people don’t tell you about parenting.” So funny and so true! I’ve loved the buzzfeed app for a while, but now have an even better reason to read. Long time lurker, first time caller! LOL! Such a sweet picture! The lights on the tree look like hearts. Beautiful family! Love all the smiles. So glad 2013 was such a great year for you all! It was for my family also! We welcomed our little Levi in January and it’s been the best year yet! Your blog is the FIRST thing I read everyday! I love laughing (and crying) along with your family, you exude love that just pours through the screen to everyone who reads your words. Thank you! Thanks for sharing your family! I enjoy reading your blog every day! Hope you have a very Merry Christmas!! Wow, thank you for the chance to win, that’s so exciting! I love reading your blog, look forward to it every morning. I hope your family has a wonderful Christmas. By the way, my kids look forward to Annabel videos every Friday. Merry Christmas to you and your little cuties! I love your blog and it’s the first thing I read every morning when I get into work! Thanks for putting all the time & effort into it!! Thank you – this is so generous. Merry Christmas! Could use an amazon gift card as I just had a new baby boy! I love reading your blog. I look forward to it every day. Adorbs! Merry Christmas to you all! Bless those sweet babes! Happy Holidays! I read daily and enjoy your writing and pictures. I have been reading your blog daily for years now. I love it! Love experiencing the joy and magic of Christmas with the kids! How sweet of you all to offer this prize! Hope Rigby has a fun birthday. Love your loves. Enjoy them this holiday! Yours is the first (and one of only a very few) blogs I read everyday. Thank you. I feel like a kid waiting to see if Santa brought me my present on Christmas morning. Oh, goodness…That is the cutest photo! Love it! Merry Christmas! Happy New Year! Love and hugs from KY! So happy for you that 2013 was great! Love the photo! Happy Holidays. I am loving the “love” tree! I have been reading your blog since my own little boy was born 15 weeks prematurely in 2008. I have loved following along with your newest joys! Look forward every morning to catching up. With the Spohrs! Merry Christmas to you all! I’ve been reading since Maddie was born and have followed your amazing family ever since! So fun to watch your kids grow up! Beautiful kiddos and puppy! I love reading about your family. Merry Christmas! Thanks for all the great stories and pictures of your kids. They always brighten my day. Love that little James! Cute picture. Thank you for sharing your family with me. Looking for the morning update is a bright spot in my day. Thank you for continuing to share your family with us!! Merry Christmas to the whole family! This is very generous of you, Merry Christmas!!! I love following along with your beautiful family from down here in Georgia. Thanks for sharing your life with us, and thanks for the giveaway! Love reading about your family and I still can’t get over how much James looks like Maddie! Happy Holidays – thanks for sharing your stories! Merry Christmas. Enjoying James’ many adventure pics! I love your blog and your family Thanks for sharing your stories with us. I love the look on the baby’s face. oh, what a delight – to win something at Christmas!!! Love them. And happy birthday, Rigby! Merry Christmas and Happy Everything!! I have a baby coming, so I could definitely use the gift card! Love your blog, Heather. Long-time lurker here Happy holidays! Very cool trick with the light! We just bought our first DSLR and I’m learning how to use it. I’ll have to try this out with our tree. Your kids are ridiculously adorable! I love reading your blog everyday Merry Christmas Spohr Family!! Merry Christmas. I love seeing all the pictures and reading about your two adorable children. You WHILE YOU WERE AT SCHOOL posts are AWESOME!! Keep them coming. Annie and James are going to love looking back on your website when they are grown. Lucky kiddos!! I love your blog. It is a part of my morning routine every day! Love following your beautiful family!! Happy Holidays and thank you for sharing your lives with us! How generous of you! Happy everything to you, too! Adorable kids. I love your photos and all your stories. Thanks for sharing. I wish I could take pictures like that. I was lucky to get a few decent ones of my three girls for our card this year, but nothing as professional looking as this one. Your kids are beautiful! Merry Christmas from a human with opposable thumbs! Happy Christmas to the lovely spohr family. May 2014 be even better for you than this year. Enjoy reading your blog every day. Bless you and your family! I am thrilled that 2013 has been a happy one for you and your beautiful family! I would love the gift card! Love your blog Heather it’s my first read every day. Adore you guys! You have freaking gorgeous babies. Seriously. So gorgeous! Happy Merry Every Holiday! Your family is beautiful and has become a great inspiration to all who visit your site. Since I began reading I have gone from a girl in grad school to a wife and mother of two. I love reading about your family and see that there are some challenges that every family goes through! I found your website a month before Maddie passed away – I think through Matt L. I thought/think you were/are hilarious. I loved your daily postings about Maddie etc.. Then when I read about Maddie passing – floored me. I have been a cheer leader out here for your family every since then. Reading the good, bad and the ugly. You (and Mike) are gifted writers. So I am out here laughing/crying/complaining with you on a daily basis! What a blessing little Jamesie is….enjoy them it REALLY does go by sooo fast. Happy birthday to the cutest dog ever! I adore how he is so sweet with your children. Wishing a happy happy birthday to cute Rigby! Happy Birthday Rigby, 9 years, you don’t look a day over 4!!!! I’ve been reading your blog since the day Maddie died (so many other bloggers I follow were referencing you that awful day). Though I rarely comment, yours is the first post I read every morning and I so love reading and watching your family grow. Merry Christmas! I love your blog. Your family simply amazes me. You are wonderful! Thank you! Merry Christmas! and Thank you for providing a year of tears and laughter by including all your readers into your life. Would love an amazon gift card for Christmas! Great photo! Love your blog and your cute family! And we love the Spohrs! Your kids are so cute. I enjoy you guys so much. Merry Christmas! I always love those heart shaped light tree pictures! And the kids are cute too! Aww, I’m so happy that your 2013 went so well. James is a beautiful addition to your family! Happy Holidays! Love your family! Reading your blog is part of my morning routine; you’re like family! Merry Christmas to you, and thanks for this nice opportunity! How wonderful that your kids will have such a great documentation of their childhoods through this blog! The heart light tree pics have become a tradition for us, thanks to you! All three (four, sorry Rigby!) of your babies are so beautiful. Merry Christmas to your wonderful family. What a nice gesture. I really enjoy reading your blog. Thanks for sharing your family with us. Thank you so much for the light shape tutorial. I went home and tried it last night and it worked amazingly. love the pic! i need to learn how to do the heart lights! I’ve loved following along watching as your family grows and grows up. As a former preemie myself, I will always remember your sweet Maddie. Thank you so much for continuing to share your writing adn family with us. You are my favorite daily read! I hope you have a wonderful holiday!! This is awesome! I love reading the blog! Love pictures of your munchkins and love Amazon! Love seeing all the photos of your adorable family! So glad 2013 was a good year for the Spohr family. I’ve followed your blog since I found about 7 years ago on another blog I used to read. Your adorable babies make me smile every time! Thank you for sharing your family with us. – Merry Christmas! Happy birthday to Rigby! Such a sweet pup. You are awesome. I love reading your blog! I hope you all enjoy a fantastic holiday season! Your kids are just the cutest!! I have been a long time reader and enjoy starting my day with your blog. Wishing you and your family a Merry Christmas and Happy New Year!! 2nd entry… look Ma, no thumbs! Merry Christmas. Happy Holidays, Spohr Family! Thank you for sharing your precious children (and doggy) with us! Have I mentioned that I love you guys?!?! That heart-shaped lights thing is really cool! How did you do it with Annie and James in the picture, too? Merry Christmas to the Spohr family!!! In all that spare time you have how about a new recipe? You guys rock, Merry Christmas! I’m glad y’all had such a great year! I hope 2014 is even better for everyone. Lurker unlurking to say your children are absolutely beautiful. I love reading about them. I love your sweet kiddos! Merry Christmas to The Spohr’s. #2 you have used your grief to help others. instead of letting it define you, it inspires you. Merry Christmas – you make me happy every day! Fingers crossed I win this, my bff’s little baby has leukemia and I would love to donate it to her!! I would LOVE a $250 gift card! Books are my love and amazon could feed my beautiful addiction! All the best to you and the wee Spohrs this Christmas! Happy 2013 to your family. What a generous idea to treat one of us to such a nice prize! I wish there was a way to sway the random picker! I love your blog and this giveaway is so kind! Though I’ve never won a thing in my life, this poor law student loves Amazon giftcards for (ugh) textbooks! Happy birthday, Rigby! Merry Christmas to one of the cutest families I “know”! Great Pic! Happy Holidays to all! You are a blessing to the blogging community and I appreciate you and your family! The struggles and joys you share of life help many understand that we are not alone in this life. Merry Christmas Spohr family! Thank you for the opportunity to win! Nothing but the best to the Spohrs in 2014 (yikes!). I love reading about your family! LOve it! SO cute and special! Happy Holidays! Thank you! I hope you have a happy holiday season! 2nd entry… happy birthday Rigby! Merry Christmas to your wonderful family! My morning isn’t complete til I read your blog! Thank you! Happy everything back at ya! Your daily pictures and blog posts bring smiles to my face. Thanks for sharing your kindness! Happy Holidays to the Sphor family!! Happy birthday, Rigby! Happy holidays, Spohrs! Happy Holidays to the whole beautiful and generous Spohr family! And not just generous for the giveaway — generous for sharing your lives with us every day! Love reading your blog. Your children are beautiful (and your dog is cute too:)! I have been reading your blog for years! Happiest of Holidays Spohr family! I look forward to seeing your new pix of James – he’s a doll. HB to Rigby! Lovely photo of your lovely babies. I like to think Maddie is in those sparkly hearts over their heads. Wishing you guys a wonderful holiday. Happy Holidays to my favorite blog family. If we could just figure out a way to clone James (put him in a copier?) I’d be the first to sign up for one–I don’t think even my nutty girls would mind a brother who’s so sweet. Love all the goodness that is going on in your life now! Merry Christmas Spohr Family! I love reading about your adorable family and “HAPPY BIRTHDAY” to Rigby! Merry Christmas to the beautiful Spohr family! I hope you have a wonderful and joyous holiday. Happy Thursday! Good luck to everyone! What a nice giveaway. Merry Christmas to you all! A wonderful holiday to your clan as well! What a beautiful picture, so full of joy! Happy Holidays! Thanks for sharing your family with all of us! Thanks again for the sweet and generous giveaway! Thank you and happy holidays. May 2014 be even sweeter! 2013 was a challenge for us, but I am still full of joy to be here! That picture is just christmas cardy! Love it! So enjoy reading about your family! Merry Christmas to my favorite family! Merry Christmas, so many blessings to celebrate this year!! What an awesome thing to do. Thank you Spohr family! Happy Birthday, Rigby! Love the pic with James. Happy everything to you too! Thank you for sharing your sweet family with all of us out here. Happy Holidays! Merry Christmas! Thank you for sharing your family and stories with me. Happy Birthday, Rigby! Such an important part of your family! I found your blog as I approached the last weeks of my second pregnancy and, Heather, you neared James’s birth. I laughed out loud at your post about Annabel’s resistance to the daytime nap, possibly because we’d just had the exact same argument with our firstborn. I love your blog. Even if I don’t have time for other blogs yours is a mustread every day. Thanks for sharing your family with the world! Those are some beautiful babies!! You have provided many of us random readers lots of joy and laughter and perspective and compassion as well, so thank you! Love it, thanks for an amazing giveaway! This would be a HUGE help this holiday!! Such a beautiful family…thank you for sharing your family with us! I also love your blog and read it daily. So well done! Happy Birthday Rigby! We (almost!) share a birthday! Thank you for this opportunity! And thank you, as well, for continuing to allow us into your home/lives! It must be hard work to keep up with the blog, along with your family and work obligations! We certainly appreciate it! I feel like I “know” you all! Merry Christmas to you guys!!! Look forward to reading your blog daily! I love your posts!! Thanks for the daily read!! That picture of the two of them is gorgeous!!! Merry Christmas!!! Merry Christmas to your sweet family! Can’t get enough of your blog and your two sweet kiddos! Wishing your family a very Merry Christmas from NM! This would be such a wonderful holiday gift! Throwing my hat in the ring for day two! Oh the LOVE!!!! It just flows back and forth and over and through them!!! I love seeing it!!! And I love seeing James developing into his own little person. But I also love how much of Maddie Moo can be seen in his face! It’s as though all 3 of your kids are glimpsed under your tree. Happy Holidays, Spohrs!!!! Beautiful kiddos! I love reading about your family!!! Merry Christmas!! I love following you’re family, and James has been such a sweet addition! Wishing you a very merry Christmas season. Your kiddies are beyond adorable!! And it has been an honor to read about your wonderful family. Here is to a blessed 2014 as well. And an Amazon gift card would be amazing at this time of year. Thanks for the opportunity!! Happy Holidays! What beautiful kids! as my husband’s british family says, merry crimbo! Merry Christmas! Love the photo! I’m all for a giveaway. Merry Christmas Spohrs!! your family is adorable! Merry Christmas! Nowhere better for a gift card! I read you every day, and even though I don’t know you, I absolutely feel as if I do. The strength of your beautiful family inspires me daily-so thank you! What a beautiful picture! Many blessings to you in the years to come. Thank you for sharing your family with us! What a lovely picture. I love that Annie & James are so in love with each other already. Hope you have a nice Christmas! I am happy for your family. Heart Lights! Thanks for the giveaway and Merry Christmas to you all. Sweet babies! Can I just have them wrapped under my tree instead of the gift card? Happy holidays! Long time reader and love reading your blog! Beautiful babies!!! Great giveaway, thanks! Look forward to your blog everyday! The blue in James’ eyes is just incredible! Best of everything to you in 2014! I think it’s so cool that you do this every year! Love the picture. Hope your holiday season is awesome! Thanks for doing the giveaway!! Love the picture, your children are beautiful as always. The contest is a wonderful and thoughtful thing you guys do! Thank you for your generosity. Your children are beautiful! So excited for the new year! Thank you for sharing yourselves and your three adorable children. I have greatly enjoyed seeing your posts on my feed over the last 5 years. Happy Holidays from Wisconsin! Thank you for sharing yourselves and your three adorable children. I have greatly enjoyed seeing your posts on my feed over the last 5 years. Greetings from Wisconsin! And what a generous offer… I could definitely use an Amazon giftcard to stock up on supplies for the kids in my classroom. I just love your little family. I love all the pictures you take!! I love to look back at pictures and remember what u was feeling when I took the picture. Wishing Rigby a Happy Birthday on this thread….who doesn’t love Amazon?! I need a human calendar in my family! Pick me! I order Amazon so much that my husband refers to the UPS driver as “my boyfriend in the brown pickup truck.” Haha! Wow so many comments!! Happy Holidays! Thank you for inspiring us to enjoy and see beauty in each day we have with our children! Merry Christmas to your adorable family!! Awww….cute photo! Would love an amazon gift card for Christmas! Merry Christmas ! Thank you! I have read you blog for quite sometime and I love the pictures of the kids. They are too cute. James looks like you Heather! Omg they are so adorable. I wanna gobble them up. Your family is wonderful, thanks! You have a beautiful family! Thank you for sharing your adventures with us! Merry Christmas! I love reading your blog! I love that you take so many pictures of your family. I would love to have shots of me and my brother in front of the tree! I would love to win this gift card! Thanks for sharing the opportunity. I enjoy your blog. Glad it has been such a fabulous year. This would be something awesome to happen in an otherwise crappy year (for me). Reading your blog always lifts my spirits though. Happy Holidays to you guys! Oh my goodness! I LOVE your while you were at preschool posts! Btw I was wondering if you have an elf on the shelf? I’m sue that could make a lot of fun blog posts alone! You are so generous! Excellent job of modeling the idea of “giving back” to your kids. I love the Spohrs and I love Amazon…win/win. Love the “while you were at preschool” posts. Keep it up! Love your blog and adore your kids! Especially think the ‘while you were at preschool’ series has to become a coffee table book!! Brilliant! happy Friday Spohrs. Have a great weekend. Merry Christmas! I love the pictures you capture of your kids. Absolutely gorgeous!! Although I live at the other end of the world i feel like I know you Merry Christmas! Thank you for your generosity! Go sphohr family!! Good morning, sunshine! I might also use $100 of the prize for used paperbacks (if Amazon has them) for a local charity of some sort. Children who don’t have a lot? Retirement home? I need to research over the next week. Thanks! Gorgeous pic! Thanks for sharing them with everyone. I love to read your posts! James has the best smile ever! He makes me happy EVERY day! Your blog has been my morning ritual for years now and I honestly would be lost without it, so thank you! I have been looking for a job for over a year now, stuck living with my parents. It would be awesome to show them some gratitude in the form of Christmas Gifts. Your family keeps me inspired by your strength!! Loved the song this morning! Love the picture you posted today. James in flannel = cuteness! Your children are so adorable! and thank you for hosting such an excellent thank you gift. Eeeeeeep how exciting! Fingers crossed. I the Spores, and Amazon. Oh, I messed up! I left a comment yesterday using my phone. I must have left “notify me of comments” checked by mistake. There are so many comments going to my email. Heather, is there something I can do to “uncheck” this in my previous post? I love the blog, but I’m overwhelmed with the email volume! I love your ‘While You Were At Preschool’ segments! I wish I had one-tenth of your creativity! Happy Belated Birthday to Rigby! I love looking at the daily pics of the kids. Love the heart shaped lights in the background! I love Annie’s songs! Can’t wait until James is old enough to sing a long with her! I enjoy reading your blog everyday! LOVE the neat heart light trick!! james is such a cute,smiley little dude,thanks for sharing your life,stories and photos with us!! You have such a lovely family. Happy Holidays! How do you get them to both look at the camera? I can’t get a good shot of both of my kids! No one can mind her singing when she is so cute. When it’s dry and ready, then dreidel I shall play. Happy Holidays to you all from very cold and snow covered Minnesota. #3 you share the good & the bad about parenting. I especially appreciated your candor about breastfeeding. I love the “While you were at preschool” series- what a fun idea! I’m loving the James on the Shelf pictures! Photo above is so adorable! James looks so much like Maddie! Love Jamesie’s hat in the Christmas tree photo – with the freezing weather here in the PNW, my husband is wearing a similar chapeau with the earflaps. It might be just a wee bit cuter on James. Love reading your blog and what the kids are up too. Annie cracks me up! Merry Christmas Spohrs! Love reading your blog daily! Merry Christmas to your sweet family! Wishing you and your entire family a very Merry Christmas! Thank you for continuing to share your lives with us! Merry Christmas from my family to yours, thank you for your generous gift offer to your readers . Love the while you were at preschool pics . Happy holidays! So thrilled for you that you have had such a beautiful year! I didn’t realize we could enter every day! Yahoo! Happy Holidays, love the blog! You guys are so awesome to reward your readers with something very generous!!! Thank You & Merry Christmas to your lovely family!! Annie can sing to me anytime at Target! Oh, how I could use this gift card to give my kids a great Christmas this year. Thanks for the opportunity! 3rd entry. Thank you for this generous opportunity! Happy holidays to the Spohr family! Thank you so much, Merry Christmas! Thanks for sharing your family with all of us. Merry Christmas! I have been following you for years now. I love your honesty and your kids are beautiful. You and your husband are an inspiration to many! Happy Holidays to your family! Thank you for being so generous! Merry Christmas! Spohrs rule…other blog families drool! I enjoyed Annabel’s song very much! Sometimes Target makes me want to break out in song too. The previous posters had it right: James does look so much like Maddie, especially those eyelashes! Merry Christmas to all of you! Here’s to an even better 2014! Cheers! I really appreciate your family and wish joy for all of you this holiday season. Thanks for spreading the holidays joy! Happy holidays! TGIF! Loved the video today. You have the most joyful looking kids! Merry Christmas! As I sit here and stress about not having money for my broken heater…$250 would be lovely. I realize Amazon doesn’t fix heaters but it sure does help with Christmas! You guys rock for being so generous. This is very generous. Merry Christmas! Just love how subtle the shaped lights are! Kiddos aren’t too shabby either! I wish I were as talented with a camera as you are. No talent here, at all. Thanks for letting us share in your family’s life. The dreidel song is adorable! Would love this. Merry Christmas. I adore your posts. Happy holidays to all of you! Thank you for your generosity, Spohrs! Happy Friday. 19 Days until Christmas! Merry christmas to the wonderful Spohr family! So generous. Yay for giveaways! Trying to get it right this time! This is so kind and generous of you! Thanks!